History presents us with myriad examples of non-violent resistance contributing to societal change. Many countries have won their independence from colonial powers with the assistance of peaceful protest, including Samoa and, perhaps most famously, India under the guidance of Mohandas Gandhi. Soviet control of Eastern Europe was loosened by advocates of peaceful resistance like Vaclav Havel in Czechoslovakia and Lech Walesa in Poland, while the power of the people eventually helped topple the Berlin Wall. Suffragettes chained themselves to fences and Martin Luther King marched with the people of Selma in order to gain votes for women and black Americans. 1968 saw people around the world raise their voices for civil rights, women’s rights and in dissent against the war in Vietnam and nuclear proliferation. New Zealand has a long history of non-violent resistance from Te Whiti O Rongomai in Parihaka in 1879 to conscientious objection during WWI and the 1975 Māori hīkoi (land march) to the protests in the 1980s against the Apartheid-era South African rugby tour and nuclear testing in the Pacific. Regardless of whether such protests are successful or not in affecting change, the ability to challenge the decisions of those in power and to openly express opinions, is enshrined in the documents of democratic societies. The Human Rights Act guarantees the freedom of assembly and association along with the freedom of speech, while New Zealand’s 1990 Bill of Rights Act promises the ‘right to public protest’. The New Zealand Encyclopaedia Te Ara describes public protest as a “democratic tool” and “an important aspect of New Zealand’s participatory democracy. It is a way for people to have their voices heard by politicians and, conversely, for politicians to keep abreast of community concerns. This encourages stable government“. Examples of peaceful protest being quashed, such as in Beijing’s Tiananmen Square in 1989, are viewed as indicative of repressive, despotic regimes crushing the rights of their people. Democracy and protest are intrinsically connected, and yet there are many examples of governments in democracies lashing out with intimidation and violence when challenged by protest movements. 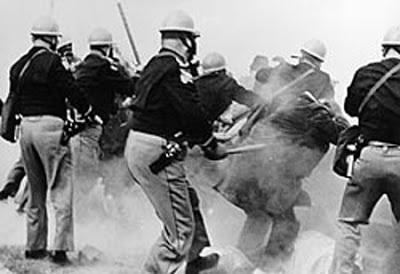 The first attempt by activists in 1965 to cross the Edmund Pettus Bridge between Selma and Montgomery made international news when photographs of police brutality were made public. Violent confrontations occurred between police and protesters during New Zealand’s Springbok actions. The French government arranged for secret agents to detonate an explosion on the Greenpeace protest ship Rainbow Warrior in Auckland Harbour. Such violent responses to peaceful protests have often caused a backlash which ultimately benefited those protesting by gaining the movement more sympathy. As a result, governments and their attendant media now focus on another tactic for quelling dissent, that of discrediting or demonising the protesters. The 2009 worldwide Occupy movement, against inequality and the bailing out of the banks in wake of the financial crisis, was regularly portrayed as a bunch of layabout, anti-capitalist, hippy socialists and this image of protesters is an enduring one. 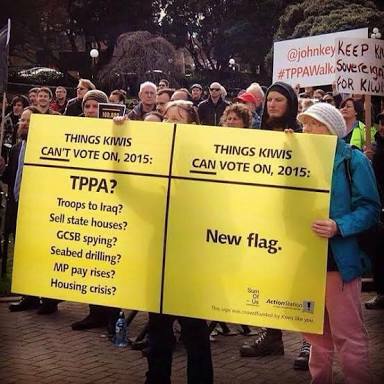 This week in New Zealand thousands of people took to the streets in protest against the TPPA trade deal being ceremonially signed in Auckland. Prime Minister John Key relied on his default description of the crowds as “rent a protest” saying, “you’re always going to get this, as a bit of a cause celebre for the left“. He also used another familiar tactic of belittling the protesters, questioning their intelligence and claiming they are all “misinformed“. “If people have a serious beef to make they should actually have a look at the commentary out there, because the commentary defeats their arguments very strongly“. This in spite of the fact that many academics, political figures and organisations, in New Zealand and around the world, including US Senator Elizabeth Warren, Nobel-winning economist Joseph Stiglitz, Medicin Sans Frontiers and the World Medical Association, have all voiced serious concerns over the trade deal. 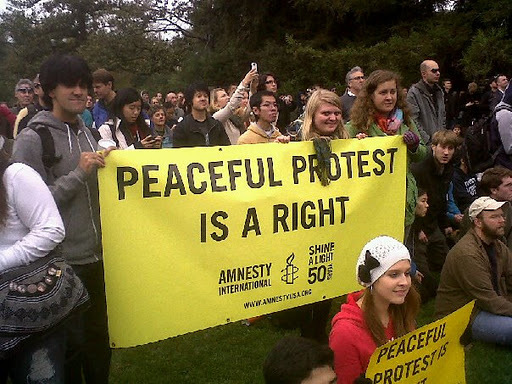 There have also been protests in many of the other signatory countries, including the US, Japan, Chile and Malaysia. 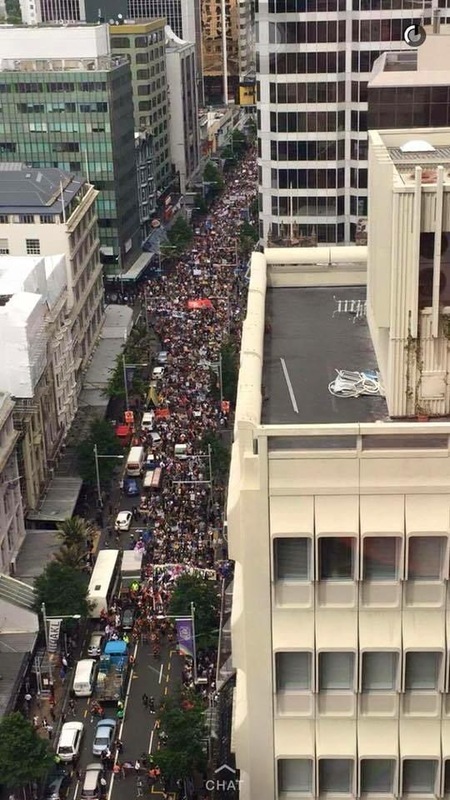 Key also relied on the argument that ultimately the protest, which stopped traffic in the city centre, was a public inconvenience and that that was more important to most people than the details of a trade deal that will impact on the future of the country, saying Aucklanders would be “pretty disappointed and a little bit confused” as to why people were protesting. Even worse than this belittling and patronising of protesters are the other examples of them being portrayed as unruly delinquents or violent troublemakers. Right-leaning radio presenter Paul Henry, while interviewing TPPA critic and law professor Jane Kelsey prior to yesterday’s protest, insisted the protest would end in violence. He employed the language of confrontation, describing, “the rabid mob outside the building” and stating, “there will be banshees turn up today and be violent“. He was gleefully willing a violent confrontation in order to discredit the whole protest movement, one which he openly disagrees with. In actual fact, not a single arrest was made. Protest is an integral part of our democratic process. In a system were we don’t have referenda on every issue, and the dichotomous nature of party politics means we may not agree with all of a party’s policies, peaceful resistance is a way of raising matters for discussion. To say we have the opportunity to vote every 3 (or 4 or 5) years is not enough, as we may not assent to every decision that is made in that time and we shouldn’t spend the years between elections apathetically accepting our collective fate. Nonviolent protest is part of the process of informing our elected government how we feel on individual issues and holding them accountable for their decisions. Rather than mock or belittle or criticise protests and those involved, every citizen should be as protective of this aspect of democracy as they are of the right to elect our officials. I’m sure that if one day a leader came to take away that right to vote, many more people would find themselves taking to the streets to exercise their remaining democratic right.